The Chicago Bears hired former Chiefs OC Matt Nagy as their head coach, who promptly tabbed former Oregon head coach Mark Helfrich as his offensive coordinator. Nagy is a relative unknown, with only six games of NFL play calling under his belt, while Helfrich hasn't stepped on an NFL sideline. Still, both have garnered high praise as offensive minds, and inherit a few equally exciting but untapped talents on the Bears. In their hunt for the next "QB Whisperer" ala Sean McVay, the Bears become a crucial fantasy football situation to breakdown and monitor, given the Nagy-Helfrich combination could take a once stale and sputtering offense to new heights. As mentioned, both Nagy and Helfrich are as green as possible when it comes to NFL play calling. 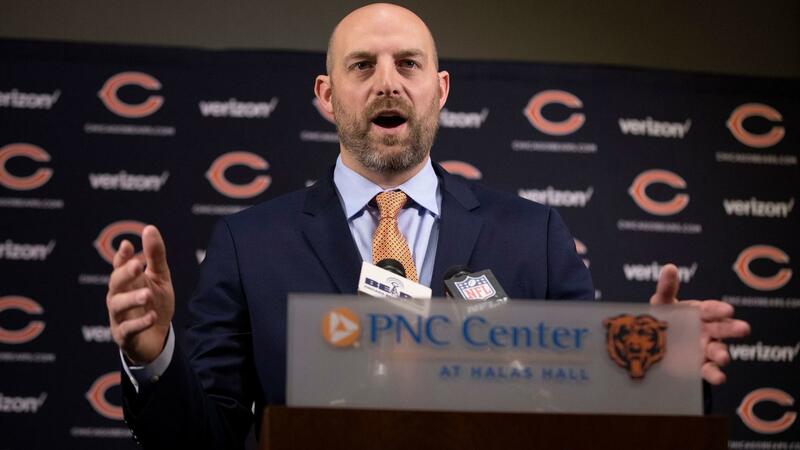 Nagy has already announced he will be officially calling the shots, but will rely heavily on Helfrich for designing concepts and schemes in the overall game plan. Nagy earned play calling honors versus the Jets in Week 13 after the Chiefs attack began sputtering. The team put up 31, 26, 30, 29, and 27 points for the remainder of the regular season, and a 21 point playoff performance, that was highlighted by an epic second half collapse. Meanwhile, Helfrich was the Oregon head coach from 2013-2016, going 37-16 over four seasons and leading Oregon to the first College Football Playoff Championship Game after the 2014 season. Helfrich's teams averaged 42.6 points per game and 536.7 yards per game, which ranked second and third among FBS schools, respectively, during that time period. Even in his disastrous 4-8 season, offense was never the issue, as the Ducks scored 35.4 points per game. 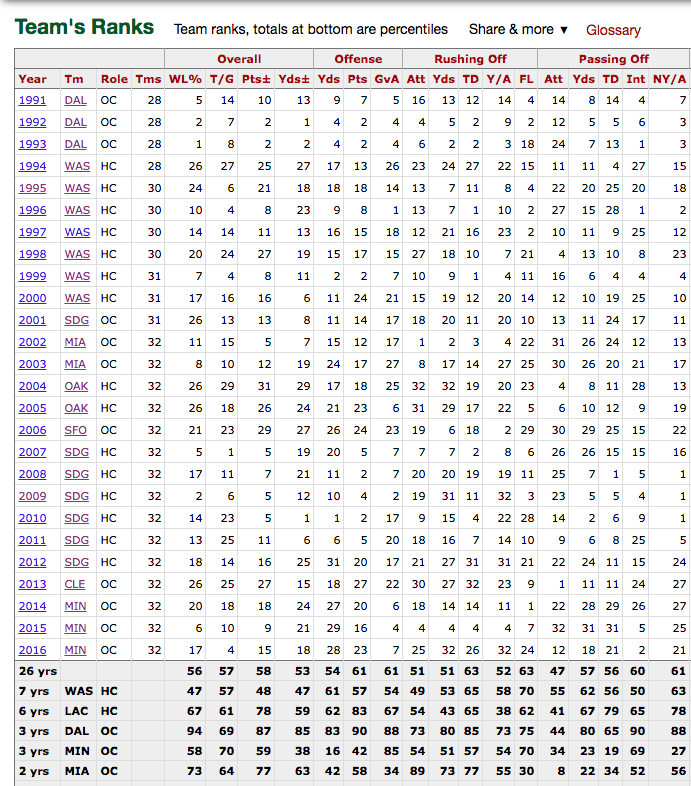 An abysmal defense that allowed 41.4 PPG (126th of 128 teams) ultimately led to his firing. To learn more about what Helfrich will bring to the NFL, you need to hear our interview with FishDuck.com's Charles Fischer, aka "The Godfather" of Oregon Football. "Overall, we’re going to be much more aggressive than we are conservative." This is where Nagy really adds his own spice to his Andy Reid "West Coast" upbringing. In general, West Coast offenses stretch defenses horizontally via a quick-strike passing attack that features plenty of ins and outs. The goal is to minimize the risk, get the ball in your play-makers hands, and let them do their thing. 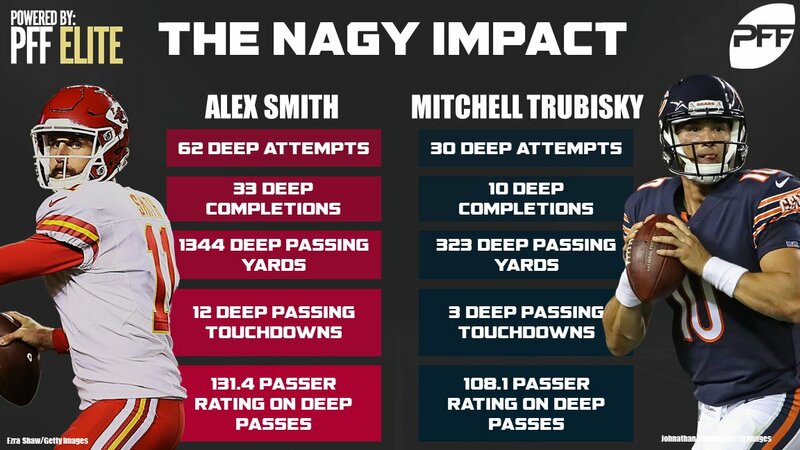 Contrastingly, Nagy's "West Coast" offense will bring far more vertical flair -- as detailed in this excellent PFF Breakdown, the normally conservative Alex Smith's 1,344 deep passing yards led the NFL in his first year with Nagy. Additionally, whereas most West Coach attacks are slow and methodical, early signs point to an aggressive, fast-paced attack. In particular, OC Mark Helfrich hails from the rapid fire, frantic spread attack of Oregon that was made famous under Chip Kelly. Despite a different base formation, Helfrich's overall philosophy featured many similarities: Tons of quick strikes. Allowing playmakers to get in space and rack up YAC. Heavy usage of the running backs in the passing game. Both Nagy and Helfrich also specialize in moving players all over the place to create mismatches, and capitalizing on versatility. “Offensively, to have a bunch of different guys that can do different things is important,” Nagy said. Specifically, two "chess pieces" Nagy will incorporate are the "U" move tight end (Travis Kelce) and the "Zebra" WR (Tyreek Hill). Nagy loves guys with speed who can find mismatches against linebackers, ill-fitting nickel-corners, or too slow of safeties. As we dive into later, he has plenty of intriguing options to fill these roles in Chicago (hello, Trey Burton, Taylor Gabriel, and Tarik Cohen). “I thought he was excellent as a playcaller...I thought he was able to put together the openers -- the first 15 plays each game -- and keep teams off balance. He’s not conservative. He’s a guy that understands that you have to be able to throw the football in the National Football League, but still has a great appreciation for the run. You got to be able to run it when everyone knows you are going to run it." "It will be different in some regards, which is only fair to our coaches on offense and the ideas they have. But the identity is going to be the same. It will feel very similar to Kansas City's. We're in the lab now. That's the fun part. All the coaches are giving their ideas and thoughts. Coach [Andy Reid] always said he had 51 percent of the say. So ultimately, he had final say. Now I have that. There are plays I liked that Coach [Reid] didn't like, so now those plays are in." In 2018, Todd Gurley added 881 yards and 13 TDs to his 2017 total. The Rams also went from dead last in scoring to 1st in the league, more than doubling their points (14.0 to 29.87). Did the line and WR upgrades help? Of course. Coaching Scheme plays a huge role in fantasy success, but is so often overlooked. Don't miss out on 2018's version of McVay. 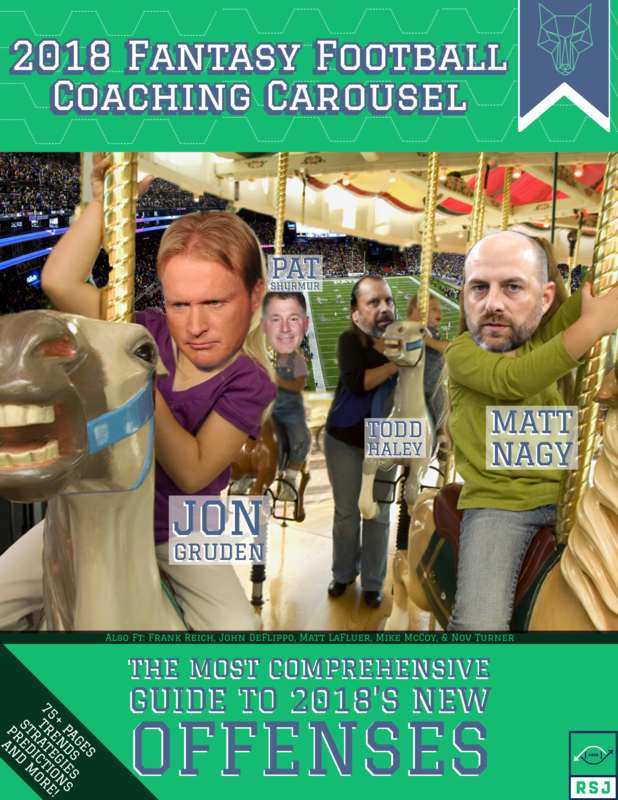 Your FREE Coaching Carousel awaits here. Moreover, Nagy loves Run-Pass Options (RPOs) and rollouts to capitalize on mobility and keep the defense on the move -- something Mark Helfrich will further enhance given his Oregon read-option roots. "I think he is the perfect coach for Mitch Trubisky. Much like (Sean) McVay brought a lot of success for Jared Goff because he was a quarterback guy -- he had a history of success; so does Matt Nagy. You know, Andy Reid disciple. Played the position. I think he is going to make this as easy as possible on Mitch Trubisky." “I just told him really how amazed I was at how he got through this first day. He was impressive. I don’t want to put too much on him. But at the same time, he needs to understand that was pretty good what just happened. Not just Mitch, but the rest of the offense. “I feel like these last three days, I’ve been coached more than I ever have,” Trubisky said. That’s not necessarily a shot at last year’s coaching staff, to be fair — there just wasn’t a similar structure in place centered around him." 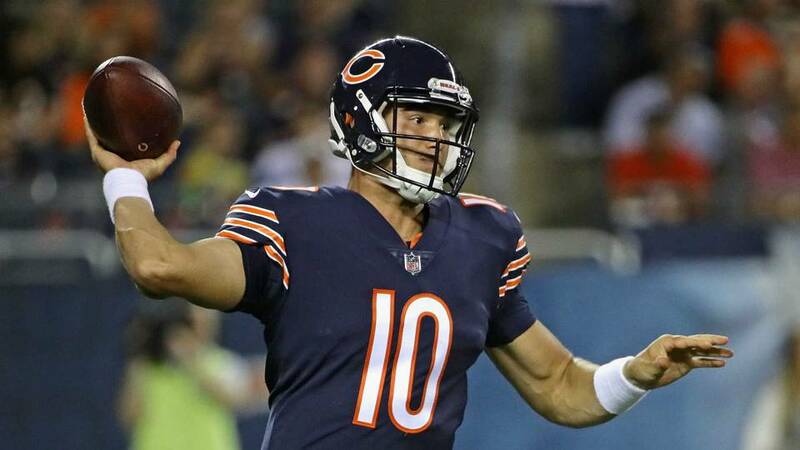 Specifically, fantasy owners should be giddy about Nagy's plans to capitalize on two major point-bringers: Trubisky's cannon arm, and his mobility. "He's kind of got that gunner mentality, he wants to go down the field and stretch it. He wants to do exactly what I want to do. Stretch the ball. Get a lot of completions. Throw it all around the yard." With big plays come big fantasy points, especially on the ground. Though completely underutilized last year, Trubisky brings some real athleticism to the table. Only five QBs have topped his 40 time in the last three years (4.67), and his 6.05 YPC on mostly unscripted scrambles ranked 5th in the league. Nagy has (obviously) noticed and plans to capitalize, stating: “The kid is very athletic. And we’d be crazy to not use his legs. It is a part of what we do. [Trubisky] did that at North Carolina," Nagy stated, before adding how he appreciates that Trubisky is smart and protects himself. "But, in all honesty, he does need to be smart with that. That’s one thing you see in college. There are some more running quarterbacks, but they are more running back-type players. That’s not the case here. "Mitch is perfect for what Helfrich wants to do. You’ve got to have a good arm to develop into a top-end NFL quarterback, and he has that. But you also need enough speed for the occasional scramble or zone read... Now Trubisky could do a little bit of zone read and elevate the offense. He runs a 4.6 forty, so again if the defensive end chases the running back inside he can pull the ball and scamper and make good yardage off of it. Helfrich will create hesitation with the zone read and then hurt them badly with the playaction. It takes a lot of pressure off the pocket passing attack"
In short, Nagy and Helfrich's coaching styles & scheme seem perfectly meshed to Trubisky's talent. This is especially exciting considering the enormous Surrounding Talent upgrades Trubisky received this offseason. We dive into those far more deeply below, but the Bears upgraded from arguably the most barren weapons cabinet in the league, to sporting a cast with volcanic eruption upside: A potential bonafide WR1 in Allen Robinson. One of the best burners in the game in Taylor Gabriel. 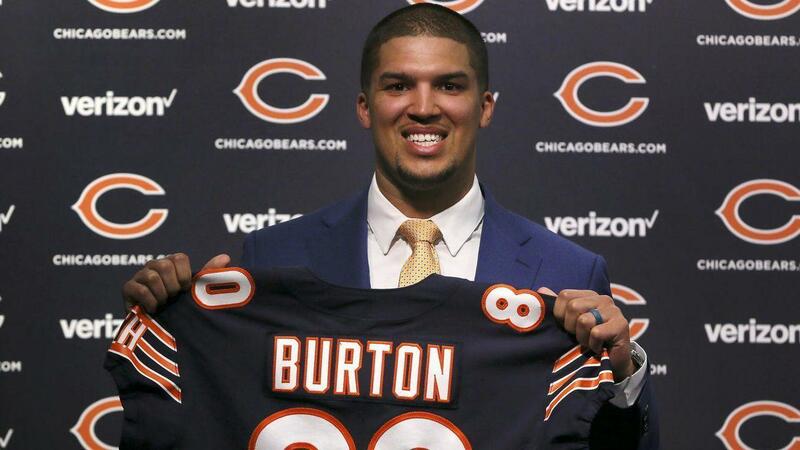 An athletic tight end to fit Nagy's important 'U' position in Trey Burton. They also got one of the draft's steals at wide receiver with Anthony Miller, who may start in the slot right away. Plus, Tarik "The Human Joystick" Cohen won't go criminally underutilized once again. Between the massive coaching and weapons upgrades, Trubisky profiles almost exactly like the 2018 version of Jared Goff. In fact, the upside is so sky-high (especially considering the 164 overall, QB24 price) could genuinely make a Carson Wentz-like leap. Nagy's 58% / 42% Pass Run Ratio suggests the volume will be there for high-end receiving outputs. Moreover, Nagy's vertical tendencies, combined with Helfrich's frenetic offensive pace, furthers the upside. Expect Nagy's to again incorporate plenty of "Out & Up," "Flood," and "Trickery" concepts (outlined here). 2018 Outlook – How Will The New Toys Be Used? After a complete (and necessary) offensive overhaul, the Bears vacated over 200 targets and 2,000 air yards. And that's from a John Fox "attack." Thankfully for us fantasy owners, the Bears now sport some intriguing talent to feast upon this aerial pie. It's clear that GM Ryan Pace made it a point to attempt to replicate many of Nagy's pieces from Kansas City, into Chicago, while adding new dimensions too. That fresh element? 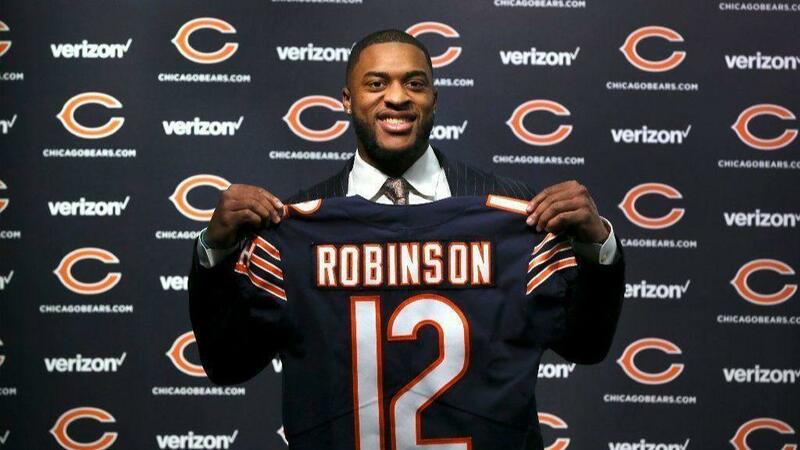 Allen Robinson. He's the big name who should bring the most fantasy value. Most acknowledge Robinson's ability to frame up defenders, and break through tackles, with his 6'2", 220 lb size. This is perfect for a "West Coast" system, meant to generate high-percentage, YAC opportunities on horizontal-based routes. Yet, few also recognize Robinson's ability to go deep. Even with slower “timed” speed, Robinson uses long strides to get downfield in a hurry, playing faster than his 4.6 forty suggests. In fact, in 2015, Robinson led the NFL with his 19 catches for 672 yards on passes that were thrown over 20 yards. Have we drilled home Nagy's love for pushing the ball deep quite yet? The risk is of course real - Robinson's now two season's removed from usefulness, and is fresh off a major ACL injury (though already practicing and expected to be ready for training camp). Still, Robinson notched 1,400 yards and 14 TDs with Blake Bortles under center in that season. Trubisky's arm, and Nagy's offense, offers far more upside. Beyond his own health, though, Robinson is contending for targets with a suddenly deep cast of weapons. Nagy also hinted at Gabriel's potential role, and it's beyond just "go." "He's able to do a lot of things we’ve done in the past, with jet motions and quick screens and some of the (run-pass option) stuff,” Nagy said. Clearly, Nagy's vision is more in-line with Kyle Shanahan's usage in 2016, where he manufactured ways to shake Gabriel free and capitalize on his homerun ability -- both deep down the field, but also in the screen game. Gabriel racked up 6 TDs before a busy 171 yard postseason with proper usage, and draws plenty of Tyreek Hill parallels in terms of skillset and build. “You want to be able to see throughout their pro days, the combine, what they put on tape — any time you can see a route that relates to what you do as an offense, you kind of tag that and say, ‘OK. Hey, there it is. I found one, Nagy said, "And so with Anthony, you see a guy that at the top of his route, he likes to stick the top of the route and it’s sharp, so what that does is it sets the angle for the quarterback." Nagy may just make Miller the 2018 Cooper Kupp. The new HC has a clear vision for the role and route tree he'll ask of Miller, and early predictions have Miller "earmarked for the slot." Gabriel may blow up more often, but Miller could be the more consistent and reliable PPR product, and both are worthy Late Round Penny Stocks. All-in-all, even if Robinson leads the team in production, he's the least likely Bears WR for me to own (unless he flat-out destroys camp). He's priced not far from his ceiling, which I think he'll have a hard time reaching surrounded by underrated weaponry and in an offense that should spread the ball to mismatches. While having a talent like Kelce at his disposal certainly helped, Nagy loved peppering his tight ends and creating mismatches. Nagy and the Chiefs were among the tops of the league in "12" Personnel (1 back, 2 tight ends); he loves featuring both a move "U" tight end that can split out wide and be put into the slot, as well as an in-line "Y" tight end. Kelce topped the team in targets last season, and has averaged over 107 looks in his last four years. Simply put: high, creative volume will be coming for Nagy's seam stretchers. Nagy’s very first personnell conversation with GM Ryan Pace revolved around finding his next Travis Kelce. This is the "U," WR/TE hybrid role that the Chiefs have peppered for years. Enter Trey Burton, who received a four-year, $32 million contract despite limited production with the Eagles. Simply put, Nagy needed him. Burton’s size can beat smaller nickel backs, while his speed can be a problem for larger players, i.e. linebackers. “That’s one of the things that I learned through coach Reid is getting mismatches throughout, and that’s what Trey does,” Nagy said. Speaking of mismatch size / speed, Burton is a physical freak -- with top performances at his position in the 40 (4.62), the 3-cone (7.14) and the 20-yd shuttle (4.32). He will be moved all over the place and be sent screaming down the field quite often. In fact, if Burton was the only real receiving threat at TE, I'd have him ranked among my Top-7 at the position. Sadly, there's another massive mouth to feed here: the 6'6", 278-lb Adam Shaheen. Though incredibly raw, the beastly Shaheen drips in red-zone upside. In fact, on only 14 targets last season, Shaheen hauled in 3 scores. He's a classic "basketball convert," who knows how to post up and leap over defenders with his frame. Shaheen remains raw, but don't be surprised to see him score 7+ TDs, annoyingly eating into Burton's otherwise huge ceiling. From Brian Westbrook to Jamaal Charles, Andy Reid's offenses have typically featured one back as a true three-down horse that's heavily utilized as a pass catcher. In fact, entering 2017 and on the back of these workloads, Reid's RB1s averaged 19.5 PPR points per game, and Kareem Hunt only boosted those numbers after a stellar rookie campaign in which he led the league in rushing. Also of note: Hunt tallied 24+ carries on only four occasions in 2017. Three of these four came from Weeks 13-17, when Nagy took over play calling duties. Lastly, expect Helfrich to bring "Zone-Read" wrinkles from his Oregon roots. As Oregon-guru Charles Fischer explained on our FFBDPod, "So again, they’ll have to defend the zone read, hat on hat blocking on playside, play action passes to deal with, spin off variations of the zone read plays like the "Pin and Pull" -- and the defense will have to defend against a true NFL passing attack. That, to me, is a lot for one opponent." As mentioned above, Nagy would ride a horse if he had one. Unfortunately, he inherits two highly talented, but role-specific backs in Jordan Howard and Tarik Cohen. Thus, a committee feels likely, but both backs possess the talent to do serious damage in a timeshare -- potentially approaching Ingram / Kamara levels of dominance if everything clicks. Howard is likely monopolize the early down carries and red zone looks, and stands to benefit from this offense taking a step or five forward under Nagy and Helfrich. Howard should have more red zone opportunities to capitalize on, less stacked boxes to face, and overall more positive game scripts that allow him to bleed more clock. As Charles Fisher emphasized when breaking down Helfrich, vision is absolutely essential for RB success in this scheme. This offense will feature tons of counters, sweeps, traps, and other pulling-based plays that aim to get the RB plenty of blockers in front, while creating cutback lanes should the defense overpursue. Meanwhile, Howard's calling card is his vision. He has an outstanding feel for run lane developments at the line of scrimmage and at the second level. 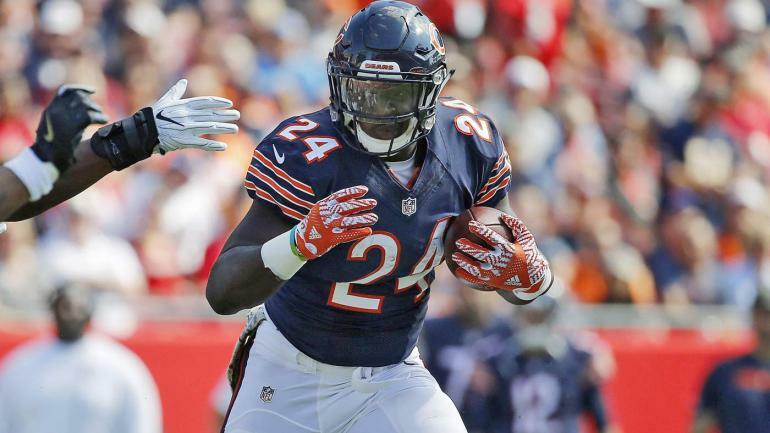 Howard's already cemented in Bears legend books as the only back to top 1,000 yards in his first two years, and he's now set up for the most success of his career; Howard faced 8 or more men in the box on 43.12% of his carries last season, third most in the league, and will greatly benefit from the influx of talent all around him. Expect low-end RB1 numbers at a high-end RB2 price, with a final stat line similar to his 1,200ish, 8ish TD average, with upside to hit 12+ TDs if this offense really hits its groove. The only knock on Howard is his hands, admittedly a pretty huge one in Nagy's system where backs are peppered with looks. Sure, Howard is again "working on his receiving," but ultimately expect him to monopolize the early down role only. Which opens the door for Tarik Cohen to absolutely explode. Cohen drips in explosiveness and huge play ability -- in fact, over 50% of Cohen's runs went for 15+ yards, making him PFF's top "Breakaway Threat" from 2017. His nickname is "The Human Joystick," after all. Yet, despite these playmaking flashes almost every time he touched the ball, Cohen remained criminally underutilized by John Fox and co. Expect the exact opposite under Nagy, who's "giddy" about all the ways he can maximize Cohen's explosiveness and versatility. As the Chicago Sun Times detailed, Cohen's 2018 usage could be so extensive and creative that he "arguably is busier learning coach Matt Nagy’s offense than anybody except quarterback Mitch Trubisky." The sophomore back has reportedly been "all over the field — running inside and outside, coming out of the backfield on pass plays, pass-protecting and lining up as a wide receiver." QB Mitch Trubisky has taken notice, saying, “It’s a great thing that he has a lot to learn because that means we’re trying to get him the ball in so many different ways in this offense...Tarik’s a really smart player; that’s the great thing about him." ‘‘Not only is he dynamic with the ball, but he understands the offense and knows how to open up his other teammates, whether it’s just doing his job or making a block or running a specific route without the ball. But we all know what he can do with the ball in his hands, and for him to be a smart player who understands the offense, we can pretty much line him up at any position." At minimum, Cohen could pile on at least 20 more receptions to his 2017 total of 53. There's a fair chance he emerges as an 10-15 carry guy, given he makes this offense far less predictable. Finally free from Fox's shackles, and now under the perfect coach to capitalize on his skillset, Cohen's 77th ADP is going to look foolish come the end of 2018. This is just 1 of 9 in-depth breakdowns found in The Fantasy Football Coaching Carousel - The Most Comprehensive Guide to 2018’s Newest Offenses. Tons of new innovators take over play-calling reigns, while old faces inherit new teams and talent. We break down them all in the Fantasy Football Coaching Carousel. Making "locked-in" conclusions about Nagy on a limited sample size would be foolish. Even so, the Bears seem destined for some major steps forward under Nagy's aggressive, "Vertical West Coast" scheme combined with the frenetic-pacing and spread philosophies of Oregon's Helfrich. Both coaches excel at maximizing their talents and creating mismatches with unique motions and formations, and the Bears suddenly have plenty to work with following a busy 2018 offseason. For one, Mitch Trubisky should have far more chances to show off his powerful but accurate arm, and could truly be 2018's Carson Wentz (or at least Jared Goff) now that he has the weaponry around him. His under-appreciated athleticism will also be maximized, with "Zone-Read," RPOs, and plenty of rollouts being called. Meanwhile, Reid's offense historically ticks with the RBs, making Jordan Howard an intriguing third rounder while sending Tarik Cohen's stock soaring. Howard, who'll monopolize early down and goalline touches, naturally rises with less stacked boxes and more scoring opportunities. Yet, Cohen is the true explosion and value candidate. His versatility and explosiveness will no longer be criminally underutilized, but instead maximized under Nagy. Expect Cohen to explode more often than not. Additionally, the additions of Allen Robinson, Taylor Gabriel, Trey Burton and Anthony Miller creates oozing fantasy potential. Though Robinson will likely lead the team in receiving, he's also priced around his ceiling right now. Nagy's attack is predicated on exposing mismatches, and Robinson isn't likely to see the true target-hog numbers many expect. Rather, I'll be chasing the explosive upside of Gabriel and Miller going at least 10+ rounds later. Meanwhile, Burton should thrive in the Travis Kelce "U" Tight End role, although his ceiling is ultimately capped with the monstrous Adam Shaheen likely to eat into his TD total and overall red zone usage. Still, the high passing volume and Nagy's vertical tendencies should put this offense, and especially Trubisky on your fantasy map. Sure, this may all seem hyperbolic, but similarly built teams have taken quantum leaps forward under the right guidance -- just look at the Rams, who went literally worst to first in scoring (2016 to 2017) thanks to a bright young coach, infusion of new talent, and the consequent steps forward from their QB. In Chicago, the line is already strong (11th graded by PFF in 2017, despite losing Kyle Long), the defense is underrated, and after the weapons overhaul, the Bears have the makings of a genuine explosion with Nagy steering the ship. Given their lackluster 2017, expect some insane investing opportunities for fantasy owners -- especially Trubisky and Cohen.